+The Fastest in the World? To all those wonderful young men and women doing a very dangerous and difficult job in demanding conditions -- a long ways from home: We send our sincere thanks. You are making a difference in this world. We hope you all will stay safe and know that you will be returning to a country that appreciates your efforts. AMAZING PHOTOS -- AMAZING FEATHERS! 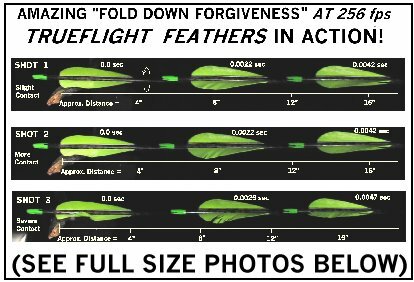 When we set out to get some photos of feathers “fold down” forgiveness, we expected them to do well. After all, we all know “feathers are forgiving”, and thought that after contact with a bow riser or obstacle down range, they would “fold down” then “pop” back up. What we weren’t expecting was just how fast and how well the feather web re-formed after the contact. A color reprint of 3 of these test collisions is shown below. Approximate distance scales and time delays are shown on the reprint. If you’d like an un-folded color reprint of this sheet (very suitable for display in your store! ), just let us know. We’ll get one out to you ASAP. When I showed the first photos to “old BC” he said, “Wow! The images are, what, 8 or 10 feet apart?” No... The images are more like 8 or 10 INCHES apart! It was hard to believe. During each collision the feather’s web shifted out of the way to clear the branch -- which is what we expected. But then the web shifted back into position and smoothed to it’s original shape almost instantly! We’re talking with in a distance of 12 inches and within a time of 4 milliseconds. We were astonished. It seemed like magic. Yet in shot after shot the web shrugged off the impact and the arrow continued downrange undisturbed. The arrow’s speed at 256 feet per second is about 174 miles per hour. At that speed it’s hard to imagine anything surviving a collision with a solid object like a branch (which was about 1/2 inch in diameter), let alone restoring itself to like new within milliseconds. After every shot, we just pulled the arrow from the back stop and re-shot it. We never had to touch the web of the feathers -- all 3 still looked like new, even after 30+ impacts. In fact, after the first shot, when I pulled the arrow from the back stop, I assumed we’d missed the branch because the feathers looked completely undisturbed. It wasn’t until we looked at the photos that we realized that the web had indeed hit the branch -- then miraculously recovered. We originally ran a complete series of test shots at 240 fps. These looked so good, we decided to re-do the photos at the practical maximum we could obtain from our standard bow and arrow combination, which produced 256 fps. 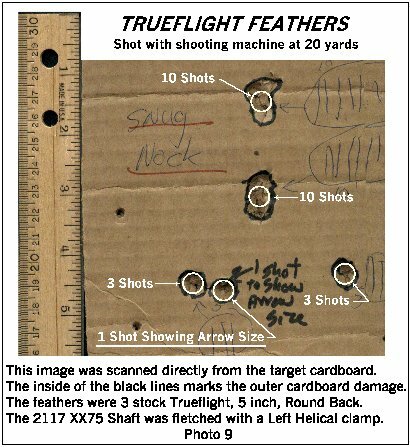 The actual feather shown in the 3 shots in the sheet survived at least 15 earlier impacts at 240 fps as well as a total of 18 impacts at 256 fps. Photo 2 shows The actual feather used, AFTER all of the test impacts! We were both surprised and humbled by these results. It was hard to believe what we were seeing -- in shot after shot. It’s even harder to explain just how the feather’s web manages to do what it does -- as fast as it does. There must be some really sophisticated aerodynamics as well as some really impressive “materials science” at work. Feathers sure do pack a ton of performance into only 2 or 3 grains of material! Photo 5 -- 250 fps arrow meets 100 watt light bulb! One of the frustrating things about our high speed photos is that the motion of the arrow is stopped so well that some folks can’t believe the arrow was actually moving when the photo was taken. Well, it isn’t magic... and it’s only medium tech! “Stopping the motion” means using a very brief exposure time. We routinely use exposure times from 12 millionths of a second to less than 1 millionth of a second. At 12 millionths of a second and arrow traveling at 256 feet per second (fps) will move only about 37 thousandths of an inch during the exposure. This means that the image will be blurred due to the arrows motion by only about .037 inches. This is small enough to show details in the web as small as about 1/32 of an inch. We use shorter exposures to “stop” faster things like bullets or arrows moving as fast as 341 fps. (See Photo 3) A few examples of what is possible with our equipment are shown in photos 4 - 7 . Naturally, you might wonder just how big of a fortune we spent buying test equipment to take these photos. Well, we didn’t have a fortune to spend so we built the equipment our selves -- for less than $200.00. It is true that our home made equipment takes a lot of time to set up and adjust. It certainly isn’t as convenient to use as commercial equipment but with a bit of patience and some trial and error, it sure seems to do the job. Here at Trueflight we routinely use a shooting machine in our testing. (A shooting machine was used for almost all of our high speed photos.) And yes, we have to admit the shooting machine shoots way better than any of us. It’s a little embarrassing to admit to being out shot by what amounts to about 30 lbs of scrap iron bolted to the floor. None the less, it’s interesting to look at just how well the shooting machine does shooting feather fletched arrows. Photo 9 is a direct scan of some target cardboard. The distance was 20 yards. The arrow was a 30 inch long, 531 grain 2117 XX75 shaft fletched with 3 --5 inch diecut Trueflight Feathers, pulled directly from a stock box. The feathers were fletched in a Bitzenburger Left hand helical clamp. One of the holes was made with a single shot to show the actual diameter of the arrow shaft. The other holes were made with 3 or 10 shots each as noted. An obvious question is, how much time did we spend “bow tuning” before making these shots. The answer is -- NONE! We’ve really gotten spoiled. Whenever setting up to do some test shooting, if the fletching is Trueflight Feathers we just see if the size and orientation of the feathers looks “about right”, set the nocking point about 1/8 inches above a right angle, then fire away! Trueflight Feathers are so forgiving that we have never had to bother “paper testing”, “bare shaft testing”, or “powder testing”. This really makes life easy for us “test shooters”. We’ve just learned from Steve Ralph's and Tom Foy in England that Trueflight Feathers have appeared in several recent movies. All the feathers in “Gladiator”, “Brave Heart” and “Lord of the Rings” were made right here in Northern Wisconsin. Trueflight Feathers will also be appearing in “Time Line” (soon to be released), and in a “really big one” about the Trojan War. We’ve always said our feathers seem to be a whole lot more “well traveled” than we are. Now here they are starring in blockbuster movies... sure makes us proud to see our own “Northwoods” products going on to “big things”! When I look back on this year I’m very thankful for the many blessings we received. One of those is your continued patronage of Trueflight Feathers. We are also very thankful to so many of you for taking the time to prepare your programmed orders for us. It most certainly is a “win-win” situation for both of us. Despite our sluggish economy we have stayed busy throughout the year processing turkey feathers for the beautiful arrows you folks create. Our new improved “Phase 3 Trueflight Barred” has continued to be a “bright” spot for us. Just about every order that comes in will have some quantity of barred included. I must admit that one single “Trueflight Barred” fletching on any arrow shaft really enhances it. I’m sure you know that our beautifully colored feathers will be one of the first things that your customers will see when they get to your arrow displays. That’s why it’s so important to us to get you the best quality feathers possible. We want to look good in your shop. 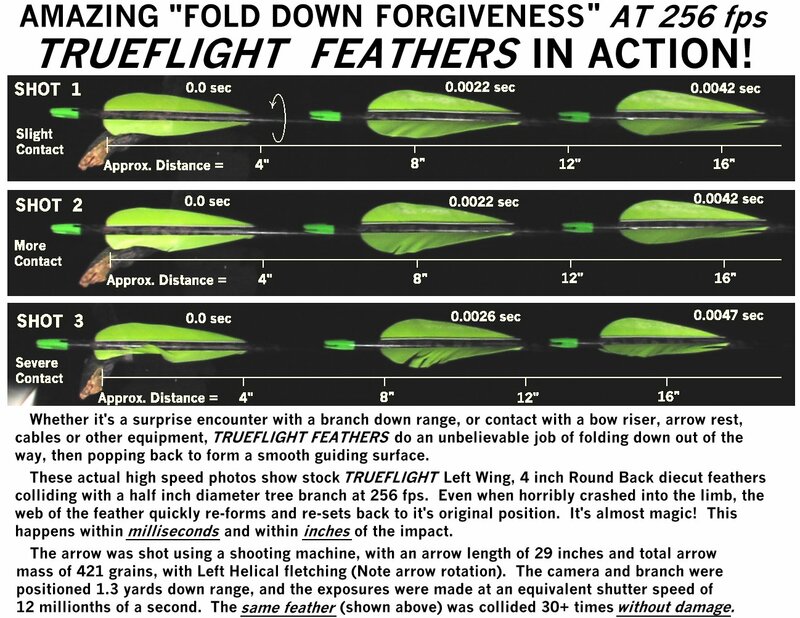 However as good as Trueflight Feathers look, those “little beauties” work overtime to give the archer the most outstanding guidance and forgiveness regardless of the type of rest or shaft. Our feathers, when put to the test in a real hunting situation will never let you down. It’s the best insurance you could have on the end of your arrows. It won’t be long and we will all be turning our thoughts and attention to preparing for the 2004 trade and dealer shows. The ATA Archery Trade Show will once again be in Indianapolis. The show is scheduled to open on Thursday, January 22nd. and run through Sunday, January 25th. Please stop in to see us at booth # 2443. All of our hardworking Trueflight employees, along with our friends at Headwaters who do the packaging, thank you for putting our feathers to such good use on all those great looking arrows. We are all proud to be doing our small part in creating some of the world’s nicest looking and best performing arrows. Faxes and email have been very useful, low cost ways for us to receive your orders. However... we have found that neither is 100% reliable. There seems to be about a 5% chance that a message sent to us gets lost somewhere out there in “cyberspace” and never makes it to us. Because of this we always try to acknowledge every fax or email order within one or two business days. So if you’ve sent an order -- and don’t hear from us within a few days, please check with us to make sure we received the original. HIGH PERFORMANCE ARROWS -- UNBELIEVABLE NUMBERS! Picking up a bow and casually shooting a few arrows sure seems like a simple, unremarkable activity. We take it for granted. We do it all the time -- without a second thought about what our arrows are actually doing and what we expect from them. The 256 fps arrow shown in our “Fold Down Forgiveness” photos is a good example of a modern arrow. Does 256 fps sound fast? Well, 256 fps equals 174 miles per hour! That is considerably faster than most cars. In fact, the very popular, currently produced Cessna 172 private airplane has a top speed of only 143 miles per hour (mph). A 500,000 lb. Boeing 747 Jumbo Jet can actually fly and maintain altitude at 150 mph! 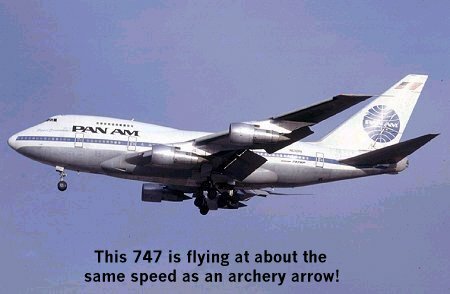 Think of it -- The aerodynamic forces acting on a 747 in flight at 150 mph are very same forces our “humble” arrows are living with -- and working with -- on every shot we make. Next time you are in a jet airliner as it’s maneuvering after takeoff or before landing, imagine an arrow flying right along side at the same speed... well, that’s reality. Sure makes a person respect what a “simple” arrow does. 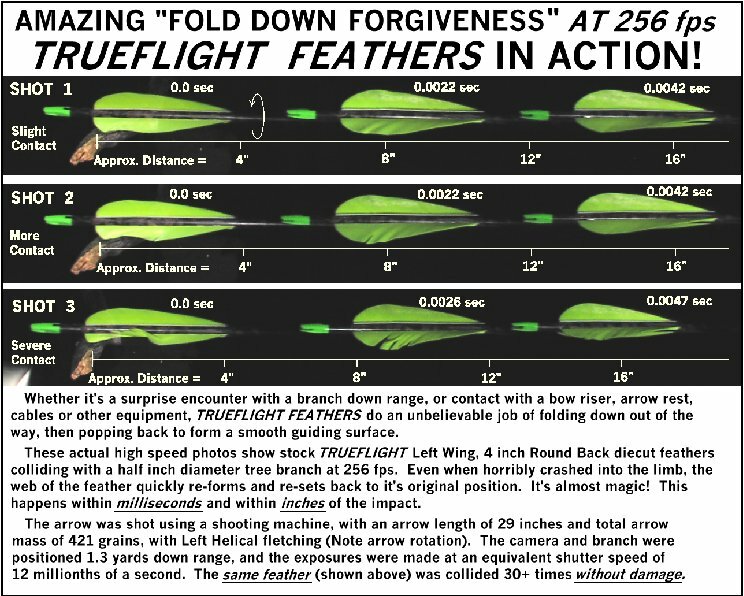 What’s even more surprising -- our feathers on those 256 fps arrows actually crash into the tree branch at 174 mph. The feathers not only survive the collision, but seem to shrug it off, pop back up and go on doing their job -- like it was nothing. I’d hate to think of what a car crash at 174 mph would look like. Of course 256 fps is not the fastest arrow possible. We have photos of our feathers on arrows at 341 fps or 232 mph. (See photo below) Even at this speed, the feathers are still doing their job and the arrows are still aerodynamically stable. Keep in mind, the fast majority of private airplanes in the world today can’t reach 232 mph. An arrow isn’t a simple lump of lead or a rock. An arrow is a carefully and cleverly assembled, aerodynamically stabilized “air vehicle”. It’s anything but a “primitive projectile”. But speed isn’t the only thing we expect from an arrow. We also expect the arrow to accelerate to it’s flight speed while it is being pushed over about a 20 inch distance by the bow string. The time our 256 fps arrow spends being accelerated is about 0.02 seconds. A car is considered “hot” if it can accelerate from 0 to 60 mph in 8 seconds. On an aircraft carrier a Navy fighter jet is catapulted from 0 to about 170 mph in around 1.5 seconds. Our arrow does from 0 to 174 mph in two hundredths of a second! Engineers often think of acceleration in terms of “Gs”. One “G” is defined to be the acceleration produced by gravity at the surface of the earth. (32 feet per second per second) We live under a constant “acceleration” of one G. Automobiles typically accelerate at 2 Gs or less. A 747 fails structurally at about 6 Gs. An astronaut or fighter pilot’s body (and vehicle) can withstand a maximum of about 10 Gs. So how many Gs is our arrow subject to on the bow as it’s released? Oh, somewhere in excess of 500 Gs! Not impressed yet? Well there is also the matter of rotation. For best stability and accuracy, we want our arrows to spin as they fly to the target. You may notice that our 256 fps arrow is clearly rotating even during the 2 feet of it’s flight shown in the “Fold Down Forgiveness” photos (which were taken 1.3 yards down range). The test arrow was fletched with 3 stock 4 inch, Round Back, Trueflight Feathers using a Bitzenburger helical clamp. Photos taken further down range show that after the first 20 feet, the rotation rate stabilizes at 1 turn for every 6.2 feet of travel. At 256 fps, this works out to a rotation rate of about 2400 revolutions per minute (rpm). This is not a mis-print! 2400 Rpm is the speed of an electric motor or automobile engine. Just for fun -- how does that stack up against other aerodynamic devices? A 747 has a maximum rate of roll (spinning along it’s direction of flight) of about 45 degrees per second, or 7.5 rpm. An F-16 fighter might roll up to 360 degrees per second or 60 rpm. For our arrow, 2400 rpm equals about 14,400 degrees per second! But the feathers on the arrow don’t just survive a rotation of 14,000 degrees per second -- they are responsible for producing that rotation. It’s part of their job. The feathers “spin up” the arrow’s rotation from zero to 2400 rpm in a distance of about 20 feet during a time of less than a tenth of a second. Those “simple” feathers sure are doing an big job in a very short time. And they do all this on shot after shot -- we don’t even think about it. No doubt about it, archery has been “high tech” since it was invented and it still is. An arrow is a mighty sophisticated, “high performance” device. Even 11,000 years ago, an arrow was something very special. I really don’t think there is such a thing as a “primitive” arrow. Granted, today’s modern materials and equipment may be more efficient and somewhat faster than in the “early years”. But even if you reduce the numbers by 1/3 or 1/2, an “early arrow” was still doing an awesome job, especially in light of the overall level of technology back then. In thinking about it I’m wondering if we could make this statement: For 10,000 of the last 11,000 years of human history the fastest man made object in the world was an archery arrow. It’s a sobering thought. It’s possible that the tip of a whip being “cracked” might be faster. But rock shot from a sling is almost certainly slower. Even more sobering is the thought that during all that time, as a practical matter, the fastest moving object in humanity’s entire world might very well have been an archery arrow!. Yes, rocks flung from a volcano might have been faster. Lightning is faster. The speed of sound is faster. The speed of the moon in it’s orbit is faster... but in human experience, when it comes to physical objects in the everyday world, I think it is very likely that the fastest object for those 10,000 years must have been an archery arrow. That’s a very sobering thought. When Ted Nugent talks about “the mystical flight of the arrow”, I think I know what he’s saying. Human beings have been able to invent a lot of technology. And much of it seems amazing to us today. But imagine how amazing, mysterious, and magical an archery arrow must have been to our ancient ancestors. It’s something pretty impressive, even today. Text and Photos copyright 2004, Trueflight Mfg. Co., Inc.